I posted this story last year, and am posting it again this Memorial Day, with a few edits. Thank you to all those who have served our country like my Uncle Art. Many people have a story of a relative who served in a war or in the service. My hero is my Uncle Art. He is a very humble man. But I want to honor him on this Memorial Day. My Uncle Arthur Volkema is a veteran of WWII. There aren’t too many of them left anymore as he served very young. He’s 90 years old, his health isn’t where he would like it to be, but he still gets around. He is like a lot of veterans…they don’t want to be the center of attention and they don’t think they did anything special. They were just doing their job. An amazing story of his Navy days in WWII, is about when he was serving on the aircraft carrier “U.S.S. Bunker Hill” when it was hit by the Japanese out in the Pacific Ocean. Over three hundred sailors died, some missing, and hundreds more injured, but thankfully not my Uncle Art. 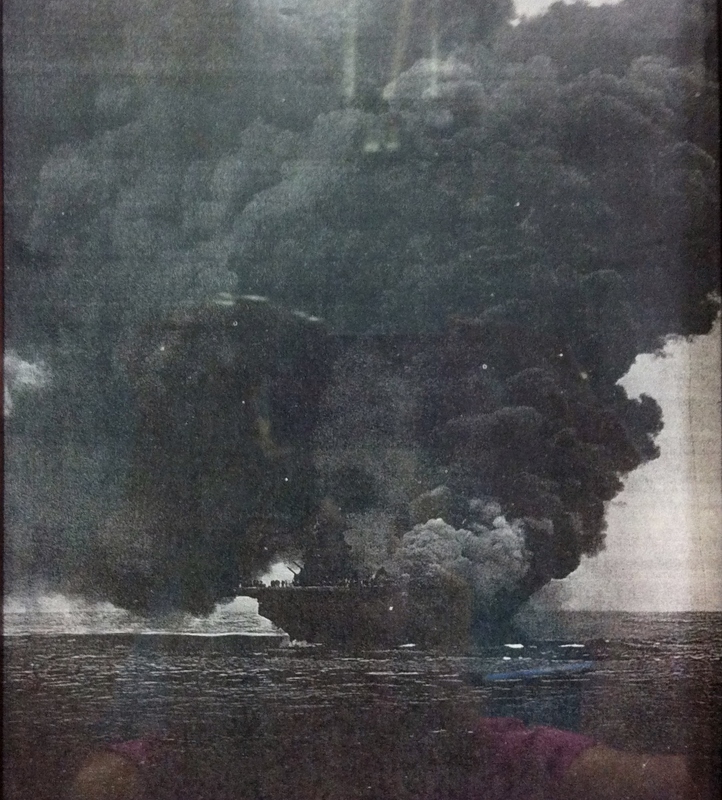 He has a picture of that ship hanging in his garage with huge billows of smoke rising above it. It’s a miracle that any of them survived. The U.S.S. Bunker Hill after it was attacked. We have a recording of my Uncle Art when he was interviewed long ago, about that awful day in WWII. It came without warning and was gruesome. Two Japanese kamikaze planes evaded the radar and crashed into the ship. The fact was, those who were left alive had to carry on immediately. They had to do what soldiers do. They put out the fires and burial at sea had to take place for hundreds of men. They had to take the dog tags or the marked belt off each one, if it was possible, so family could be notified. The clergy-person said a few words, and by tens they were put to sea. All this while wondering if they would be attacked again. The first and only time my Uncle was willing to be in a Memorial Day parade to be honored was in Holland, Michigan a few years ago. His entire family came along to watch and we were all so proud of him. He rode by in a car wearing his “Bunker Hill” cap and waved and smiled. Then we walked to the grave-sites of my grandparents and lots of other relatives to reminisce. Of course my Uncle Art has always meant a lot to me personally, because he is my mom’s brother. He is also the only surviving sibling of five children. After the war, he went on to marry my Aunt who has a gentle, loving and encouraging spirit towards me and everyone who has ever met her. Uncle Art and his wife Pauline are about the sweetest, kindest couple you could ever meet. They have been like second parents to me. Being the extremely welcoming and caring people that they are, they have been so encouraging to me over the years. My Aunt Pauline still writes hand-written letters to the “elderly” people in the nursing facility nearby their simple suburb of Chicago area. They go to church, read their bibles and pray. They brought up their three children to be wonderful Christian people and now have several grandchildren and great-grandchildren. They live a quiet God-honoring life. I’m so thankful that I got to enjoy my Uncle Art all these years. I wouldn’t have had the cousins that I do. I wouldn’t have known him and experienced the stories he tells of the history of our family and the town he grew up in. He was the youngest brother my mom watched over. They lost their mother at a very young age too, so the family struggled. My mom Martha, the oldest, holding her youngest sibling, Arthur. My Uncle Fred is on the left, and my Aunt Bertha is on the right. Today, on Memorial Day, I think about my Uncle Art and the sacrifices he made for our country. If men and women wouldn’t serve our country in the military, we would not be free. I enjoy freedoms of The United States of America because of brave soldiers who have died, or served in the past or present. Thank you from the bottom of my heart. I love you Uncle Arthur Volkema. I have another Uncle, Fred, and my Grandfather, who also have stories I’d like to tell…to be continued another day. 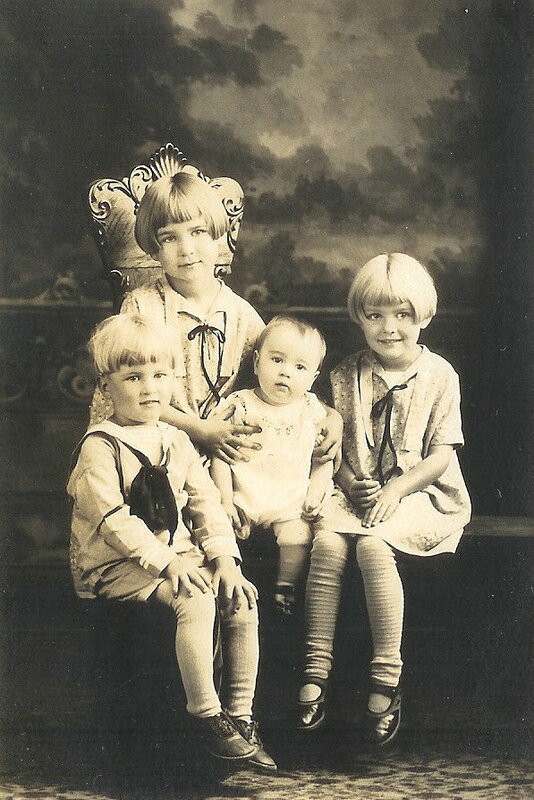 This entry was posted in ancestors, Ancestry, Family, God's faithfulness, Memorial Day, Memories and tagged ancestors, ancestry, family, God's faithfulness, Memorial Day, memories. Bookmark the permalink. Thank you for your comment. It is a joy to share my Uncle’s story, he is so dear to me, he’s now 91 and in declining health, and lives a few hours from me so I don’t get to see him much. I just read this amazing story! Thanks for sharing! Has your uncle been on the Honor flight? Thank you. He intended to do an honor flight a few years ago but his health declined. That’s so nice that they do those. I don’t know where your uncle lives, but here in Indiana we take lots of medical support on the trip. My dad had been extremely ill at 85 years old, and we saw no way for him to go. But a month later, he was headed to DC. It gave him new life. Blessings to your uncle for his service!